This is the bread that I fell in love with in Stockholm from the award winning book Riddarbageriets Bröd By John Sörbergs.I am offering both my version and the original for comparison. The original uses two starters, a white wheat starter and a rye starter. 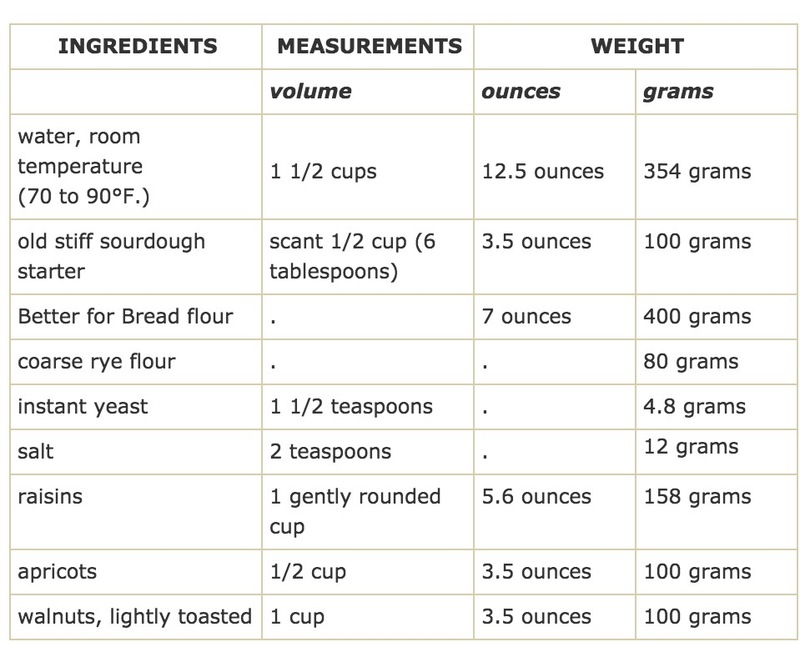 Since I only have a white wheat starter I calculated the amount of rye in what I assume to be a liquid starter and added that to the over-all flour for the dough. I substituted instant yeast for the fresh yeast and increased the percentage slightly as I’m using old starter rather than active starter. I increased the hydration from 66 percent to 70.5% because I have come to prefer a lighter moister crumb. And I shaped the dough into a torpedo/batarde rather than a round boule and slice it on the diagonal but if you prefer you can shape it into a boule. I’ve found that softening stiff starter in the water for a minimum of 30 minutes helps it to integrate more evenly throughout the crumb. The starter gives this bread extra moistness and depth of flavor. If you don’t have one you can substitute old dough from the last batch of bread. It keeps at room temperature for about 6 hours refrigerated for 48 hours, or frozen for about 3 months. If you omit the starter and the old dough you’ll need to use 1/8 plus 1/16 teaspoon less salt. This bread is wonderful with cheese including blue cheese or just with butter. 1) Soften the starter In a large bowl, or mixer bowl if using a stand mixer, place the water and tear in the starter in small pieces. Cover and allow it to sit for about 30 minutes. 3) Let the dough rise Using an oiled spatula or dough scraper, scrape the dough into an 4 quart dough rising container or bowl, greased lightly with cooking spray or oil. Push down the dough and lightly spray or oil the top of the dough. Cover the container with a lid or plastic wrap. With a piece of tape, mark where double the height would be. Allow the dough to rise (ideally at 75°F to 80°F.) until doubled (to 3 quarts), about 1 hour. Using an oiled spatula or dough scraper, remove the dough to a floured counter and press down on it gently to form a rectangle. Give it 2 business letter turns, round the edges and return it to the bowl. Again, oil the surface, cover, mark where double the height will now be (4 quarts) and allow it to rise for about 45 minutes to 1 hour. (It will fill it fuller than before because it is puffier with air). If time allows, for extra flavor give the bread the second rise overnight in the refrigerator. Turn the dough onto a lightly floured counter, cut it in two equal pieces, and press each down to flatten slightly. The dough will still be sticky but use only as much flour as absolutely necessary. Cover it and allow the dough to rest for 1 hour before shaping. 5) Slash and bake the bread With a sharp knife or straight edged razor blade, make three 1/2 inch deep slashes in the top of the dough. Mist the dough with water, quickly but gently set the baking sheet on the hot stone or hot baking sheet and toss 1/2 cup of ice cubes into the pan beneath. Immediately shut the door and bake 5 minutes. Reduce the heat to 400˚F/200˚C and continue baking 15 minutes. Turn the breads around half way and continue baking 15 to 20 minutes or until the bread is golden brown and a skewer inserted in the middle comes out almost clean. (An instant read thermometer inserted into the center will read about 206°F/97°). 1. Mix all ingredients except raisins, apricots and walnuts. 2. Use the stand mixer with mid speed for 12 minutes or knead for 20 minutes. 3. When you have 20 seconds left from this time mix in the fruits and the nuts. 4. Let the dough rest in a bowl under a baking cloth for 2hours. 5. Cut the dough into three pieces and shape as shown on page 18 in the book. 6. Let the pieces rest for 10 minutes. 7. Press down the pieces, use wheat flour if sticky. The dough should be approx. 5cm (1,97inches?) high. Sprinkle a little flour on the pieces. 8. Put the breads on a tin plate and let them rise for 2 hours. Please note that they will not rise that much because of the amount of fruit and nuts. 9. Warm the oven to 250 degrees Celsius/ 482 degrees F.
10. Put the plate into the oven and spray also water into the oven. 11. Lower the temperature to 210degrees Celsius /410 degrees F.
Please note: This juicy bread will be preserved a longer time than others, thanks to the fruits and nuts. If you are allergic to nuts, use figs instead.